Well, they don't make album covers like this any more, do they? Yes, that's Lita Ford's 1983 Out for Blood album, which is probably not remembered in 2010 for its contributions to pop music. Below you can find an alternate cover for the same album. Not much of a change, eh? Well, it was the 1980s, wasn't it? Surely that excuses at least some portion of the error? 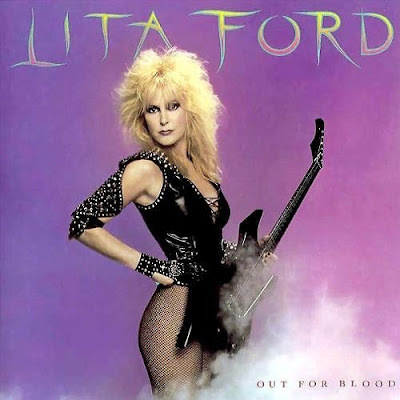 I remember thinking Lita Ford was pretty cool, but MOSTLY I remember the guy who had the locker next to me had carved "LITA" into his leg with a pocket knife.